WHALE IN THE DOOR is a passionate account of a woman's transformative experience of her adopted home. For thousands of years, Howe Sound, an inlet in the Salish Sea provided abundant food, shelter, and stories, for the Squamish Nation. After a century of contamination from pulp mills, a chemical factory, and a copper mine, the Sound, a noisy, stinky, polluted place, contained many biologically dead zones. Marine life was severely diminished. But major efforts by the Squamish Nation, governments, and industry has produced dramatic returns of herring, dolphins, porpoises, orcas, and humpbacks. Today, Howe Sound, a spectacular fjord in Vancouver's backyard, is a popular recreation and tourism destination. The recovery, however, is fragile. The Sound is being inundated with proposals for re-industrialization-a controversial liquid natural gas plant, pipelines, super tankers, a gravel mine on a salmon-bearing estuary, and major residential and commercial developments. 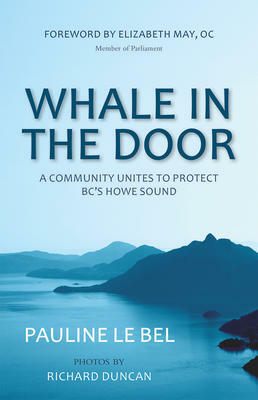 Pauline Le Bel, a resident of Howe Sound, embarks on a journey of discovery to find out what is special about the Sound, its wild nature and its people, to witness the cultural and spiritual revivals taking place. Her research, her interviews, her travels on the land, the water, the skies of Howe Sound, compel her to abandon antiquated ideas about wilderness and community, and to arrive at a new appreciation for the genius of her home. WHALE IN THE DOOR invites readers into a story of biological resilience as a community struggles to shape a vision for its future.